i've started a new category tag for 'flavor bomb' recipes because sometimes certain dishes/recipes require such a description. if i called this "tuna salad," it would just seem so sad. also, i'm real skerred about taking photos of meat in general and now, specifically, tuna fish. i sure hope people think this looks tasty and that the photos translate the actual deliciousness of this tuna salad!! because it is! this recipe was inspired by a tuna salad i used to get from this pasta deli next to the starbucks i worked at in college. i'd go over there sometimes on my lunch break, only on days when i was feeling a little crayzay like spending a lil moolah on some eats instead of the same ol' discounted/free bagel or breakfast sandwich that i am still to this day so perma sick of. anyhoo, i once made the grave mistake of ordering a full pound of tuna salad there (because you'd order everything by the pound and i had no concept of what an appropriate weight for a serving of tuna salad was) and it cost me like $9!!! even though the sign probably/definitely said "$9 per pound," i just couldn't believe the amount in the cup they'd served me was anywhere near a full pound, let alone $9 worth of tuna! dat shi is supposed to be on the cheap cheap, so i thought! this instance was similar to the time that i paid $8.22 for a bag of green grapes at the store and i will never forget it!!! granted these were the cheapo depot college days where i didn't want to spend more than $4 on anything. needless to say, the cost of that tuna salad and the green grapes just flabbergasted me and i probably told this tale to everybody who would listen, and learned some life lessons on price per pound trickery along the way. so, in this frugal season of my life, i learned that i needed to order closer to 1/3 pound of the tuna salad if i wanted to also get a potato roll and breeze out of there having only spent around $4. then i'd swing over to the utensil/napkin/free homemade bread croutons zone and pop a few of those hunks o bread in my little box on the way out and make it back to the 'bux where my free break beverage awaited me. ah those were the days. in real life, the ingredients for this tuna salad are super affordable and the whole thing is very easy to make. the outcome is soooo flavorful, fresh, zingy, and satisfying. i like using the crunchy part of the leaf near the heart (is that what its called?..heart? i mean the whiter crunchy firm area), for stability and crunchability. texture is everything, people. 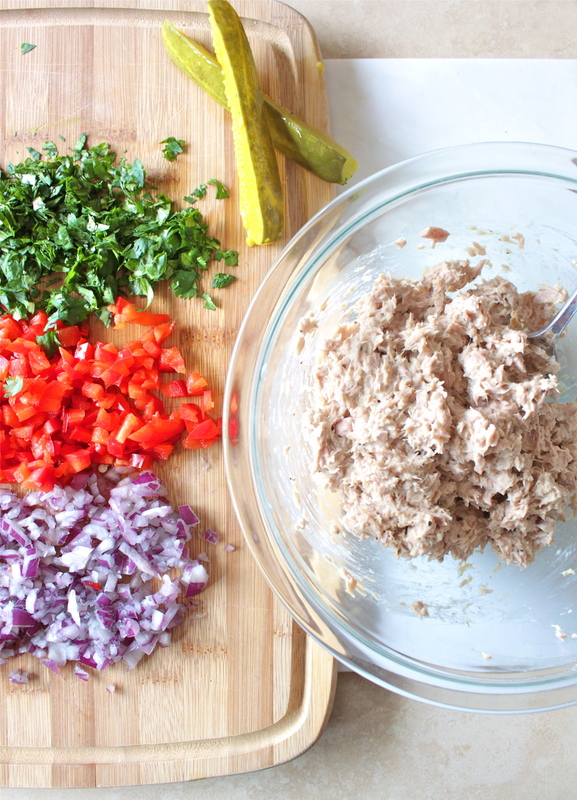 Drain the liquid from the canned tuna fish and place tuna in a medium bowl. Add mayo, pickle juice, salt and pepper and mix roughly with a fork to combine. Don't mix it too much; you want the tuna to be chunky still. Chop the red onion, cilantro, and red pepper and add to the bowl. Gently mix just until ingredients are incorporated. 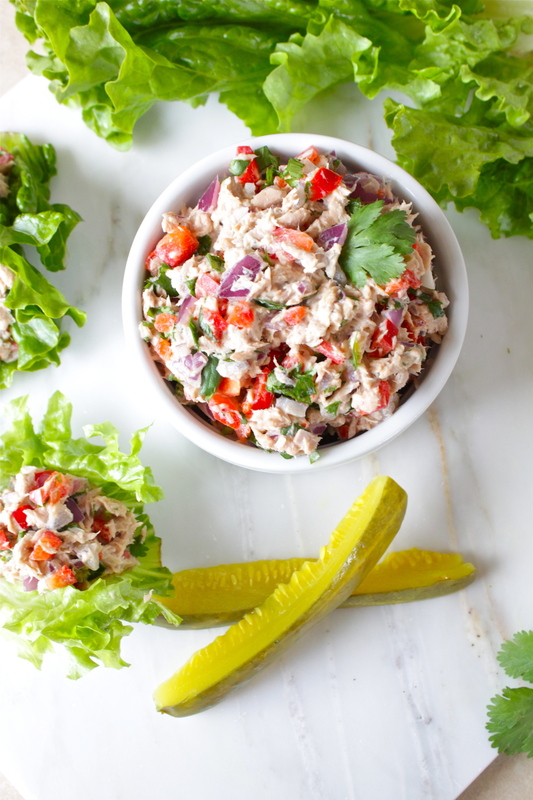 Serve this tuna salad immediately, using romaine or green leaf lettuce as lettuce wraps/cups, or pita bread to sandwich the tuna salad in.